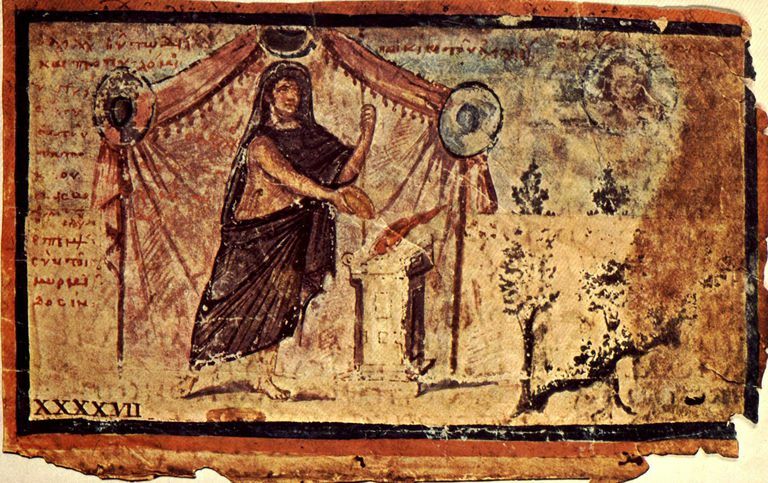 Achilles sacrificing to Zeus for Patroclus' safe return, from the Ambrosian Iliad, a 5th-century illuminated manuscript. Epic poetry, related to heroic poetry, is a narrative art form common to many ancient and modern societies. In some traditional circles, the term epic poetry is restricted to the Greek poet Homer's works The Iliad and The Odyssey and, sometimes grudgingly, the Roman poet Virgil's The Aeneid. However, beginning with the Greek philosopher Aristotle who collected "barbarian epic poems," other scholars have recognized that similarly structured forms of poetry occur in many other cultures. Two related forms of narrative poetry are "trickster tales" that report activities of very clever disrupter beings, human and god-like both; and "heroic epics," in which the heroes are ruling class, kings and the like. In epic poetry, the hero is an extraordinary but also an ordinary human being and although he may be flawed, he is always brave and valorous. The characteristics of the Greek tradition of epic poetry are long-established and summarized below. Almost all of these characteristics can be found in epic poetry from societies well outside of the Greek or Roman world. The content of an epic poem always includes the glorious deeds of heroes (Klea andron in Greek), but not just those types of things—the Iliad included cattle raids as well. There is always an underlying ethos that says that to be a hero is to always be the best person he (or she, but mainly he) can be, pre-eminent beyond all others, primarily physical and displayed in battle. In Greek epic tales, intellect is plain common sense, there are never tactical tricks or strategic ploys, but instead, the hero succeeds because of great valor, and the brave man never retreats. Homer's greatest poems are about the "heroic age", about the men who fought at Thebes and Troy (a. 1275–1175 BCE), events that took place about 400 years before Homer wrote the Illiad and Odyssey. Other cultures' epic poems involve a similarly distant historic/legendary past. The powers of the heroes of epic poetry are human-based: the heroes are normal human beings who are cast on a large scale, and although gods are everywhere, they only act to support or in some cases thwart the hero. The tale has a believed historicity, which is to say the narrator is assumed to be the mouthpiece of the goddesses of poetry, the Muses, with no clear line between history and fantasy. The tales are told in a mannerly composition: they are often formulaic in structure, with repeated conventions and phrases. Epic poetry is performed, either the bard sings or chants the poem and he is often accompanied by others who act out the scenes. In Greek and Latin epic poetry, the meter is strictly dactylic hexameter; and the normal assumption is that epic poetry is long, taking hours or even days to perform. The narrator has both objectivity and formality, he is seen by the audience as a pure narrator, who speaks in the third person and the past tense. The poet is thus the custodian of the past. In Greek society, the poets were itinerant who traveled throughout the region performing at festivals, rites of passage like funerals or weddings, or other ceremonies. The poem has a social function, to please or entertain an audience. It is both serious and moral in tone but it doesn't preach. Hatto AT, editor. 1980. Traditions of Heroic and Epic Poetry. London: Modern Humanities Research Association. How Did an Ancient Warrior's Kleos Live on After His Death?